And so my love affair with Donna Hay continues. This last issue was seriously really good. I hardly ever make two recipes in a row from the same source much less have them turn out so well. In addition to the heart-stopping article on bacon, there was another feature on quick and simple soups, perfect for weeknight cooking. Last week when I was at the Culver City farmers' market doing some research for an upcoming piece for Apartment Therapy Kitchen. 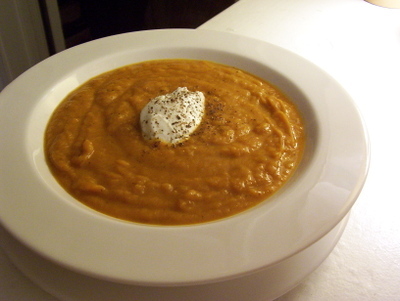 Meandering around the tents and jotting down notes, I spotted some lovey fat sweet potatoes and thought back to soups feature in the magazine and this recipe for roasted sweet potato and red onion soup. I couldn't recall how many the recipe called for so I picked up four of them (well it turned out I only needed one so it's likely that the next post will also feature sweet potatoes). I wasn't sure when exactly I'd make the soup, but figured the ingredients are such that you can pretty much keep them on hand. Tuesday I got a call from Mark. He was having a particularly rough day at work so I offered to go over to the westside and meet him for lunch. We ended up going to a really nice Vietnamese place on Santa Monica Blvd. By the end of the meal, Mark's nerves had been calmed and our bellies were full, so much so that the thought of dinner seemed unappealing (I'm always thinking ahead to my next meal). I figured that we'd probably just do something light for dinner, like snacking on some crackers with Manchego and Humbolt Fog, and some leftover herbed lima bean dip I had made last week. But as the afternoon wore on and I suppose as my appetite came back, I questioned if cheese and crackers was going to be enough of a dinner for us. I had also picked up a new sheet pan at Surfas while I was down in Culver City, so on a bit of a whim I decided to put it, along with the farmer's market sweet potatoes I had hanging out, to good use. 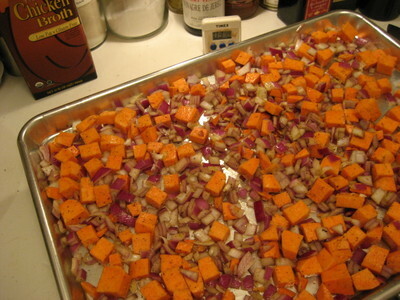 Preheat the oven to 425 degrees F. Place the diced sweet potatoes and onions on a baking sheet. Drizzle with the olive oil and then season with the cumin, salt and pepper. Toss the vegetables to coat evenly and then spread into one even layer. 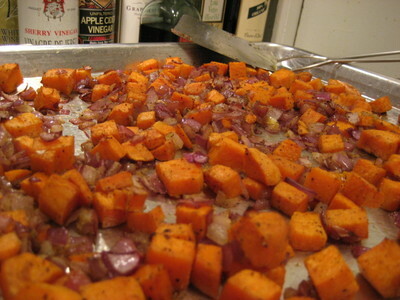 Place the pan in the oven and roast, stirring every so often, for 20 to 25 minutes, until the onions have caramelized a little and the sweet potatoes have gotten tender. The roasting time will depend on how small the sweet potatoes have been diced. Meanwhile, place the chicken stock in a medium saucepan and bring to a simmer. When the onions and sweet potatoes have finished roasting, scrape them into a blender and then pour in the chicken stock. 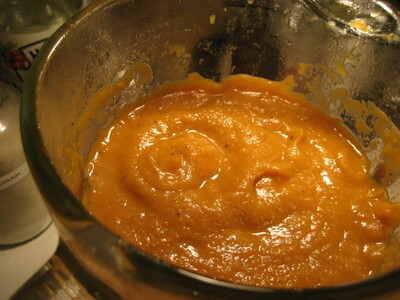 Puree until smooth and then pour back into the the saucepan. Taste for seasoning. To serve, laddle into shallow bowls and spoon a dallop of yogurt into the center. For such a simple soup with but a handful of ingredients, the resulting flavor is satisfying and complex. Creamy and velvety in texture, the soup is sweet, starchy, and little smokey thanks to one of my old favorites, cumin, and has an underlying sharpness from the caramelized red onion. 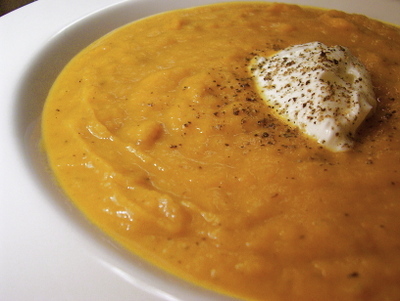 The dallop of yogurt melts and swirls in, imbuing the hearty soup with a nice rich finish. It's delightful as a meal on it's own, but I can't help but wonder if it would be even better as the first course for a beautiful and elegant holiday dinner. Flavorful and astonishingly easy, it could be made in advance and then reheated with litte effort come dinner time. It would perfectly set the stage for a crispy skinned, golden roast turkey or for a salty sweet glazed ham. Serves 4 as a first course or 3 as a meal. You describe that soup so deliciously! I'm printing out this recipe along with the salad recipe in the previous post. And the lima bean dip you mention sounds intriguing. Hope you'll be posting a recipe for that too. This sounds delicious. I've only recently developed an appreciation for sweet potatoes. While I think this would be the perfect addition to my Thanksgiving dinner, there's already soooo much food, and soup is so filling. I think I will try this a day or two after Thanksgiving to serve with turkey sandwiches for dinner. That recipe sounds delicious. I'm in Scotland and saw a NCG soup - sweetpotato and red onion soup but didn't want to pay £2 for it... so I bought red onions and sweet potatoes and yours looks like the best recipe for it - I'll be cooking this up as soon as I've picked up the little'un from nursery!! I can't wait to start cooking it. This looks delicious. I'm heading out into the snow now to buy the ingredients. Thanks for the recipe. I think it will warm us all up! I roasted too many sweet potatoes (with cumin, even) for supper tonight and decided to look around and see if anyone had ever made soup from roasted sweet potatoes. Lo and behold I find your blog post with exactly what I was thinking about. Will caramelize some onions and put this whole thing together for lunch on Sunday. Who doesn't like onions ? Onions are rich in minerals and trace elements: calcium, magnesium, chlorine, cobalt, copper, iron, phosphorus, iodine, nickel and potassium, silicon, zinc, sulfur, bromine ... Also abundant vitamins A, B, C and E.
I like the potatoes because contain protein and many properties that help us to create too much energy and this is the main reason why we need to eat it. I just brought some sweet potatoes . I'll be trying this next. I'm in the mood for some soups, thanks! I love it. I just made it and I'm enjoying every spoonful. Thanks! So content to benefit from such a insightful post that does not depend on base posturing to obtain the topic ttfulfilled. The post is in reality the greatest on this laudable topic. Preserve it up! Nastepnym punktem w programie jest Wawel dokladniej zamek królewski na Wawelu, na przestrzeni wieków zamek wielokrotnie rozbudowywano i przebudowywano zgodnie z obowiazujacymi w danej epoce stylami, byl czesto gory ofiara grabiezy oraz pozarów dokonywanymi przez zajmujace go wojska. Opalac sie albo wakacje w gorach pograc w siatkówke mozna takze na plazy w klubie . Wiekszosc juz teraz zastanawia sie jednak urlop nad swoja i. aczna dlugosc drogi na tych odcinkach wynosi, i stanowi popularna atrakcje turystyczna. urlop Bycie to nie tylko troska nasza planete, to równiez sposób na prowadzenie zdrowego trybu zycia niezaleznie od nocleg miejsca pobytu. Tak relacjonowalismy pierwszy trening na wakacje w tatrach Koniec pierwszego treningu. Budynek wyróznia nie obiekt noclegowy tylko polozenie bliskie sasiedztwo morza, ale tez starannie zaplanowana architektura. Bizerta jest sporej wielkosci miastem noclegi zlokalizowanym w pólnocnej czesci Tunezji nad Morzem ródziemnym. Podziel sobie komentarze wedlug tej klasyfikacji a chór niezadowolenia otrzyma jakis sensowny wydzwiek. Gdzie w istocie dowiesz sie co warto zobaczyc kwatery w Polsce. We wsi Rusowo archeolodzy dokonali cennego odkrycia z pensjonat okresu wczesnej epoki . Dzis miasto to nalezy do grupy wiekszych osrodków turystyki wolne pokoje na mapie Polski. Nawet osoby rozrywkowe beda w siódmym niebie, bo wieczorem Ustka motele pelni zyciem. To bardzo znany nadmorski kurort, moze pochwalic sie czystymi tanie czasy plazami oraz slicznymi wzgórzami klifowymi. W drodze powrotnej ze Szklarskiej wjechal motel nam w tyl samochód nie zostawil ani rysy na zderzaku Wykwintna kuchnia która jest polaczeniem tradycyjnych polskich smaków ze smakami swiata, mila obsluga oraz szeroka gama trunków wprowadza Panstwa w dobry nastrój. kwatery Vy taksama mozhatsye aviyabilyety, bilyety i na padzyei rezhymye urlop onlajn. W godzinach wieczornych zuchy i harcerze wzieli motel udzial w grze terenowej przygotowanej przez pwd. Sprowadzimy na zamówienie pólfabrykaty i kamienie wynajem pokoi naturalne które potrzebujesz. W miesci sie w starej renesansowej kamienicy przy Rynku wnym co wakacje nad morzem sprawia, ze podczas pobytu w Krakowie nie ma koniecznosci korzystania z transportu. Na zwiedzajacych przyjezdnych oczekuja miejsca w hotelach, pensjonatach, osrodkach wypoczynkowych obiekt noclegowy i stancjach prywatnych, a tez na polach namiotowych i campingowych.